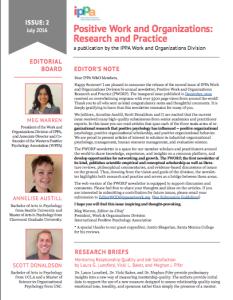 The Work and Organizations division of IPPA is now accepting submissions to the third issue of their bi-annual publication, Positive Work and Organizations: Research and Practice. This publication is aimed at creating a space for scholars, practitioners, and student members of the IPPA Work and Organizations Division to share knowledge, experience, insights, and opportunities for professional growth. It highlights both academia and practice, and builds a bridge between the two. Categories for submission include theory and research briefs, practice briefs, interviews with experts, book reviews, and news and announcements. Please review the submission guidelines and process here. The deadline to submit your content is February 15, 2017. Email submissions and questions to Meg Warren at EditorWOD@ippanetwork.org.